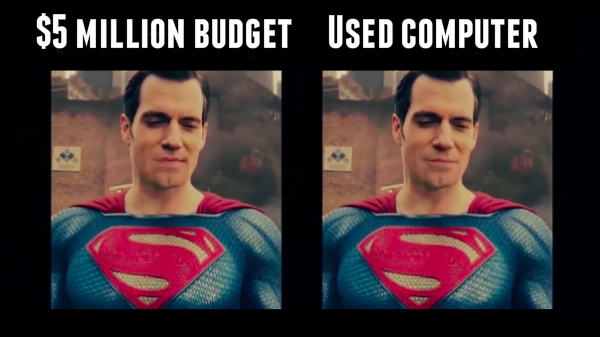 When the Justice League film premiered in November, its plot was lost on some viewers—they were too distracted by the wonky CGI effects Warner Brothers used to remove Henry Cavill’s mustache. “[The mustache’s] essence definitely lingers,” wrote BuzzFeed. The club’s moderator demonstrated the tool on the facial hair on Henry Cavill, who played ‘Superman’ in Justice League. As it turns out, Warner Brothers’ alleged US$5 million job had nothing on this AI’s ‘shaving’ skills, and it involved just a regular computer. “I used a US$500 computer bought off Craigslist and free ‘deepfakes’ software to teach an AI how to digitally remove Henry [Cavill’s] mustache in a variety of situations,” they detailed in a blog post. Watch the digital barber at work in the video below.